Our final mock draft attempt. Scroll down for a complete Saints mock draft. See our previous, short-lived version 3.0. (32) New Orleans Saints - Here's the best of what's left: Cal DT Tyson Alualu (AH-loo AH-loo), Alabama DT Terrence Cody, Florida DE Carlos Dunlap, USC DE Everson Griffen, Texas DT Lamarr Houston, East Carolina DT Linval Joseph, USC S Taylor Mays, UCLA DT Brian Price, TCU LB Daryl Washington. Interesting scenario unfolding here. Don't rule out any of the above players, even with the Jimmy Wilkerson signing. That lowers the probably of a defensive end being chosen, but doesn't rule it out. This is a difficult choice, as one can't argue with any pick that targets defense, except perhaps middle linebacker and in-the-box safety. The depth at all other positions is fungible. No linebackers demand they be taken here. Wouldn't be a shock to see them take Washington, though its not like he or anyone else would be a slam dunk to start at strongside linebacker, where Scott Fujita's absence is missed. The defensive ends here are talented but with red flags. Dunlap is flagged for character/off-field issues, Griffen for work ethic. How much do the Saints worry about them? Should TCU's Jerry Hughes slip to 32, and we have him going at 31, we'll stick with previous predictions and go with Hughes as an end/linebacker edge rusher for Gregg Williams. Price and Cody turn Loomis away with weight issues. It would be a sea change for him to accept one of them. We're tempted to go with a fast-rising Linval Joseph or Tyson Alualu here. Unlike Price, Joseph showed the ability to overcome weight issues in college, though conditioning with a 330-pound man always remains a concern. Both Price and Joseph left school early, but it was Price who showed up at his Pro Day overweight, and Joseph who was down to a relatively svelte 319 pounds. Joseph is a fast riser but there are still questions about conditioning, refinement. 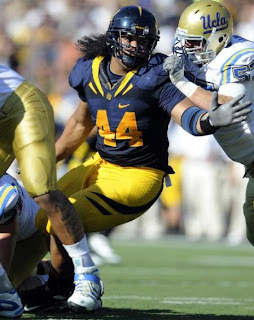 Alualu is a great football player with sparkling intangibles and work ethic. The only reason the Saints wouldn't like Alualu at 32 is if they feel they need a player who is better at two-gap defense rather than one-gap attack. Do the Saints have room for Alualu on the depth chart that already features Ellis and Hargrove? Yes. That's who we're going to go with here, the Hawaiian-descent UCLA DT Tyson Alualu (AH-loo AH-loo). Hard to rule out Everson, though, though Alualu is better value. Alualu is a mature, high-character, high energy player with two children. Starting in a 3-4 defense in college, Alualu would be a higher draft pick had he played in a defensive system that encouraged him to attack and provided more opportunities. He made the All-PAC10 team at defensive end - instead of Griffen - and is highly coachable. Limited only by height, Norwood is a spotless-character team captain and tackle machine who can be the type of versatile player the Saints showcase in their varied offense. A great football player at the highest collegiate level, Norwood could be used a strongside linebacker and defensive end depending on Gregg Williams' mood. McFadden has good bloodlines, his brother is Cardinals CB Bryant McFadden, and cousin is LSU superstar CB Patrick Peterson. McFadden emulates the kind of tight man skills that the Saints have in Greer and Porter. Alternative: Texas LB Roddrick Muckelroy. Another high character, smart player with great instincts. Excellent football player but only a good athlete, Muckelroy would be used only on special teams until he could crack into the starting weakside linebacker job. Heady, fiery small-school quarterback heads west for understudy tryout. Given a season or two, he'll have a shot to replace Jamar Nesbit as the interior utility-man on the offensive line. Saints will use this pick to draft a player they won't be able to sign on the undrafted market. 280-pound Sheppard projects to LDE in the Saints' system.